Are you looking for a unique and fun gift? This list is filled with gift ideas perfect for every occasion; and the best part is: BATTERIES ARE NOT REQUIRED! Let’s face it; our world is filled with electronic devices! And sometimes I wonder how much creativity is being wasted when we spend hours playing a video game or watching TV. Some of our family’s greatest memories were made while playing a board game or jumping rope outside. I call for a change; let’s start bringing back those toys that get us active or let our creativity shine! 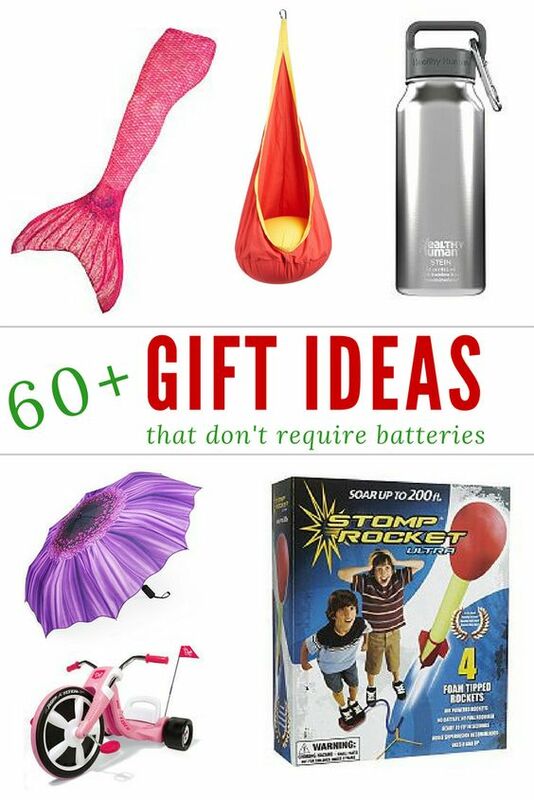 Here are over 60 items that require no batteries! We bought this for Christmas last year and my daughter still plays it nearly a year later! We LOVE our Genesis bows! We’ve had both colors, hours of outdoor fun! This book shows how a circle, divided like a pie, can be used to make pictures of all kinds. Using just 4 simple shapes. This jump rope rocks! We have a range of colors from 6-16 feet, and all the neighborhood kids enjoy jumping with them! I may be buying the jump-rope book to add to our fun! This is great for the active athlete; keep their water cold with this insulated bottle! This is a neat bird call; my daughter has it and loves it! She has a few friends who want one too! Fanciful Fabric Bird Wings and Eagle Wings are great for those with active imaginations! Kangaroo Jumps are not only fun to play around with; you can even use them for cardio!